I remember where I was two years ago—out in Los Angeles, still working, rather cheerless but resolved to make the changes in my life that I felt I needed to make. By this point two years ago, I was slowly withdrawing from the industry that I had worked so hard and had been so fortunate to break into, and I registered on the official GMAT website on June 16, 2014. It was not an easy decision for me to start quitting the things I was doing, and I spent the following year assuring myself that I was not giving up or selling out but pursuing things that were better suited for me. I was not in the group of people who needed an MBA to continue forward in their job path; rather, I needed an MBA because I needed change (a sentiment that, I was relieved to discover later, was not uncommon among my peers). July 2014—after spending a couple weeks on the East Coast having heart-to-hearts with family and friends, I returned to L.A. and got to work. With my preference for structure, I signed up for GMAT prep classes, which I attended every Saturday morning that summer. I also attended MBA fairs and school events, where I was able to meet admissions representatives and alumni and get a sense of the schools prior to making the larger commitments of visiting and applying. Having started the application process in the summer, I did miss out on some diversity and field-specific pre-MBA opportunities, but I decided that I would not wait another year to apply, and I used my shortened timeframe as motivation for me to focus on achieving something that I knew was going to alter the course of my future. I completed my GMAT course at the end of September. Meanwhile, I finalized my list of target schools and visited them, taking advantage of diversity events if I could (for example, Stern hosts a terrific “Opening Doors for Women” breakfast every Fall). Under this timeline that I had decided for myself at the start of the process, I took my GMAT as soon as I thought I would be ready (in my case, late October) so that I would have time to focus on my application essays and retake the exam if needed. I applied to my list of schools in January, and after my interviews, I constantly had to remind myself that it was out of my hands until I got my first acceptance—I remember the wave of relief that washed over me when I received it, this letter that was my ticket to a new life. July 2015—I had said my goodbyes to everyone I knew in L.A. and was driving across the country with my father. With the move back to New York a reality, I remember feeling for the first time in a while that my future was as open as the road ahead of me. July 2016—After a whirlwind year, I’m working at my internship and amused at the fact that my classmates were correct—I indeed have transferable skills, despite my constant half-joking that I would not given my creative past. So far, I’m quite pleased with my internship at a media consulting agency, and along with that pleasure is my growing disbelief that I was lucky enough to land at a firm that really does seem to fit who I am and what I want to accomplish this summer. Having spent the year wondering about how my non-traditional background would be perceived by employers (as I did when applying to b-schools), I never expected to find a firm that would simultaneously value my creative background and allow me to grow in the professional direction that I wanted. Yet it happened because a Stern alum at the firm thankfully saw potential in me, much like how Stern itself saw potential in me a year before. I’m prone to reflection, so I often think about all of this and feel that it’s really quite bizarre how far I’ve come and how different my life is from then to now. I’ve moved cities, met hundreds of new people, forged dozens of true friendships, and I no longer feel the ennui that I used to feel. I’m so grateful for Stern, so grateful for my classmates, so grateful for the alums who got me my internship interviews—so grateful that they’ve all changed my life for the better. On June 16, 2014, this was all just a dream, an imagination to serve as motivation for seeking change. I never thought that two years later, in the process of earning my M.B.A., in this energetic city and at this wonderful school, I would actually live a life better than what I had hoped for. 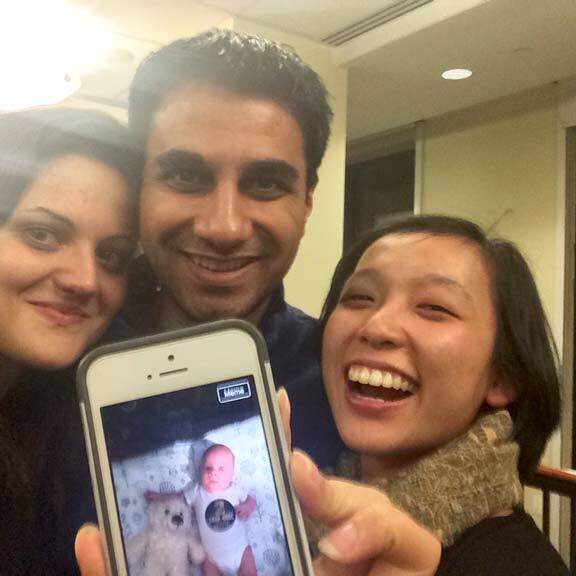 With two of my best friends at Stern, taking joy in a photo a classmate sent us of his infant son (pictured here at 2-months-old). Next PostNext Come Visit Us!